The agency that oversees the state’s medical marijuana program admits there are problems with the scoring process used to grant medical marijuana growing licenses. 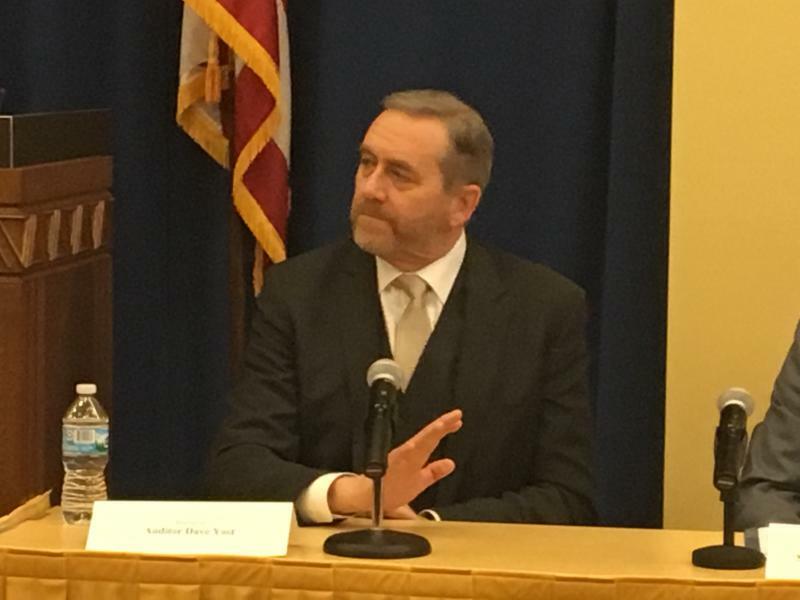 The Commerce Department now says, in a letter to state Auditor Dave Yost, there were scoring errors in the process for determining which companies were awarded medical marijuana cultivators’ licenses. That admission was made in a letter from the head of the agency to Yost, who has been critical of the process for months now. One problem he’s identified is that passwords were shared, so it is impossible to figure out who made changes within the system and when. A written statement from the Department of Commerce says, due to an error, financial plans were downloaded twice, affecting 10 of the 110 applicants. And this, according to the statement, resulted in one company which would have received a license being denied one. There’s no suggested solution from the department for that situation now. But other companies are blaming the scoring process and, in some cases, the scorers themselves. Janet Brenneman’s Green Camp Provisions LLC was turned down for a license. Brenneman says her group didn’t get points for key criteria because the scorers never had access to all of it. 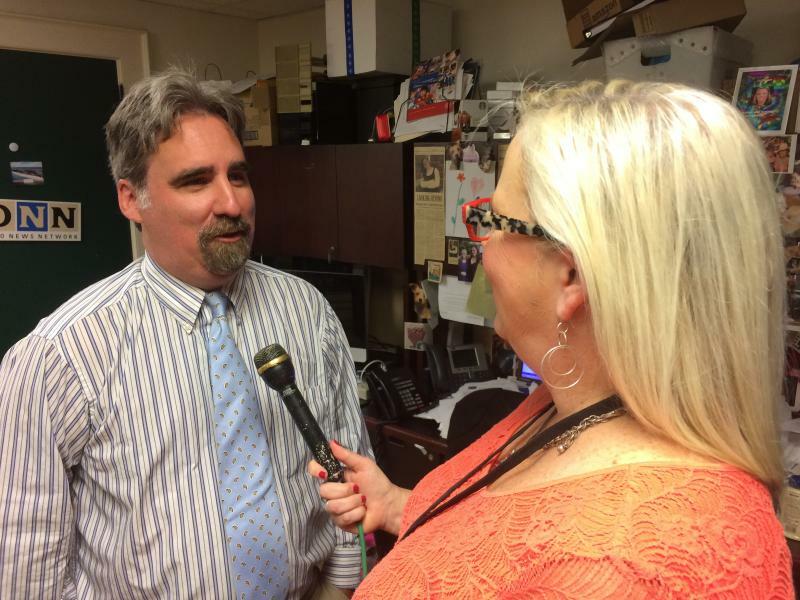 Brenneman was further incensed to find out some applicants were allowed to change locations of facilities after those documents were submitted. She says her group was told nothing could be changed after the application was turned in. Brenneman says her company is appealing the decision. Andy Joseph with Ohio Grown Therapies LLC is also appealing. Like Brenneman, he says he was confused as to why scorers gave his plan a zero in one section….a mistake he says could make a big difference. Ingles “And you think you probably would have gotten it then? In addition to appealing this decision, Joseph has also applied for processing and dispensary licenses that will be awarded sometime in the spring. Perhaps the most vocal critic has been Jimmy Gould, a backer of Cann-Ascend, one of the groups that was denied a license. 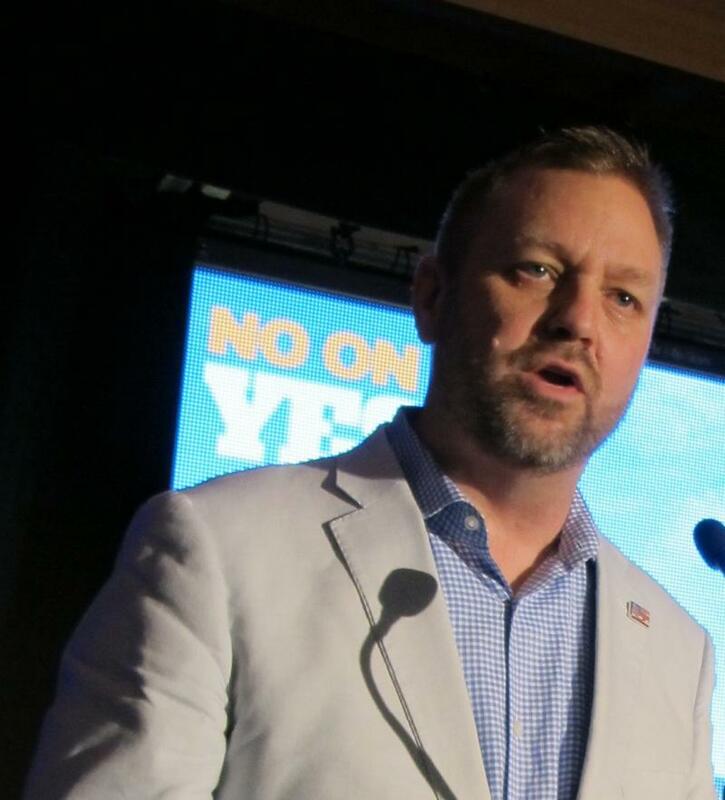 Gould, who was involved in the failed 2015 marijuana ballot issue, is livid after discovering the state hired a man with a felony drug conviction to serve as one of the scorers. And he questions ties that man had with other applicants who did get licenses. Gould is planning a lawsuit and also is involved with a group hoping to go back to the ballot for an all-out legalization of marijuana. For now, Yost says the Commerce Department needs to stop moving forward and investigate the problems he’s discovered. In her letter to Yost, Commerce Director Jacqueline Williams said her office is willing to pause any portion of the process that Yost deems adequate. But a do-over might not be so simple since some companies awarded licenses have already broken ground and put money into their effort. Take Cresco Labs. It broke ground on a multi-million-dollar facility in Yellow Springs in December. Company spokesman Charlie Bachtell, at that time, praised Ohio for the way it has handled the program. A written statement from the Department of Commerce says it has a responsibility to ensure the most qualified applicants receive a provisional license. And it says the auditor will verify these findings as they are in the process of a full review. Backers of a plan to put an all-out legalization of marijuana before voters this fall say they plan to introduce it in a couple of weeks. 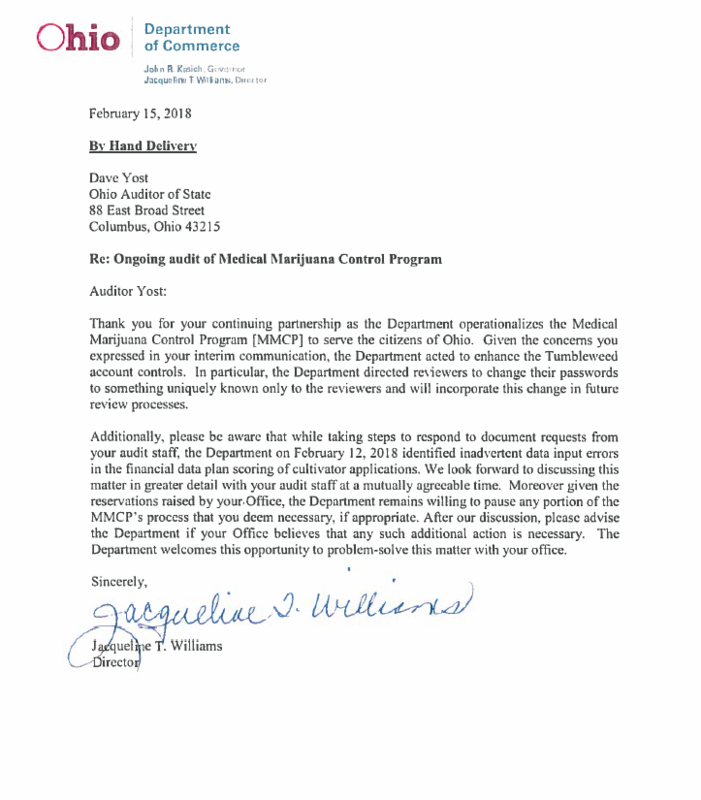 Ohio’s auditor has found a big problem with the process for scoring applications from those interested in growing medical marijuana for the state’s new program. An Obama era policy that made is possible for legalized marijuana to become a reality in some states has now been rescinded by the Trump administration. What might that mean for Ohio’s medical marijuana program, which is set to be operational in September? 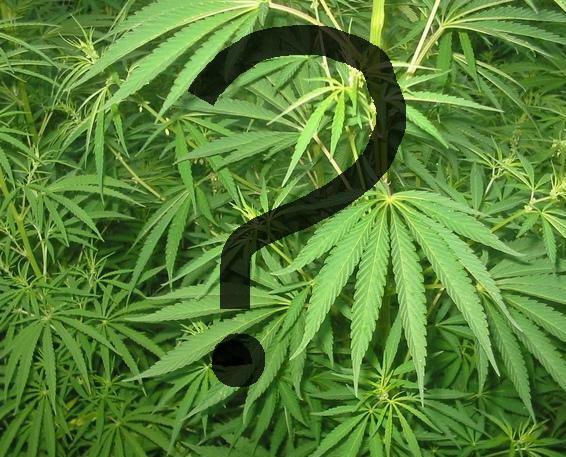 Ohio’s leaders continue to ask questions about the process used for awarding licenses for the state’s new medical marijuana program. 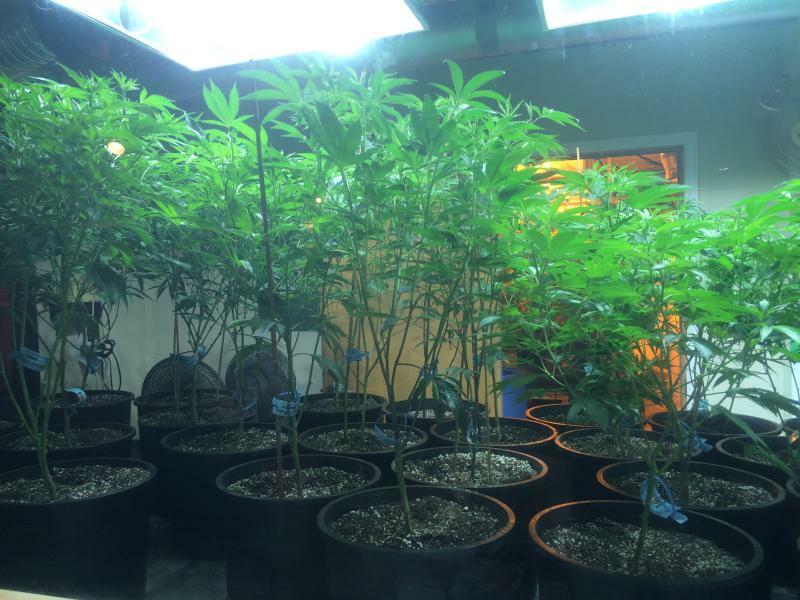 The state’s new medical marijuana law goes into effect Thursday. That means Ohio is now able to start putting the process in place to allow Ohioans to get medical marijuana. But that doesn’t mean Ohioans who have illnesses to qualify for the drug can get or use it anytime soon. 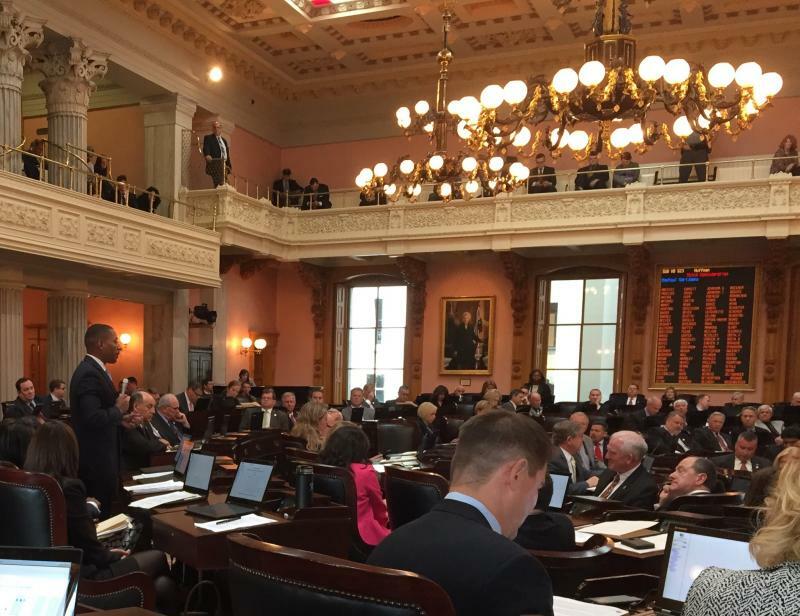 After more than twenty years of repeated attempts, the Ohio House has overwhelmingly approved a historic bill that would allow regulated medical marijuana in the Buckeye State.